The idea of this piece is to treat electrons as the most basic building blocks and to develop a form of artistic expression by determining and manipulating the electrons' paths inside an electronic circuit. Two cathodic tube TV sets are involved in the set-up and function as radiating electron sources while visualizing the sounds as a consequence of a video input error. A simple camcorder is used to document the performance and simultaneously generate the source video signal to be distorted by the audio. The distance between performer and TV screen is the main adjustable parameter and represents a variable potential barrier, which the electrons from the radiating screen have to cross. When they hit the performer they run through his body and out through the cable in his mouth, inducing an immediate physical sensation i.e. a painful "taste" of electricity, which "forces" the artist to preserve a natural balance of tension and resolution throughout the piece. 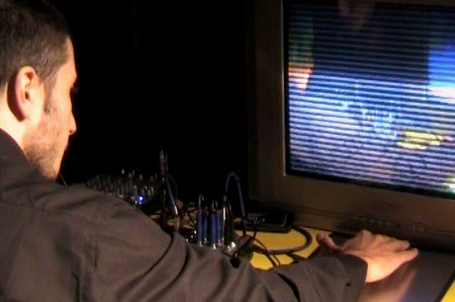 The signal then continues into an oscillating audio mixer (input connected with output), where it gains a distinctive frequency and is finally combined with the original video signal. The location of the player inside the two dimensional, electrodynamic field created by the two right-angle positioned monitors controls both the audible pitch and the distortion of the video signal. Eventually the combined audio and video signals end up in a fragile feedback chain, producing complex audiovisual events, virtually without any concrete input. Two monitors allow a two dimensional approach (two oscillators => two voices controlled with the position of one hand).